the sorrow and the love of my Heart, should be honoured more. One who contemplates me, consoles me. Nennolina was not alone in having her heroic virtues recognized by the Church this morning. There were seven others; among them was Mother Maria Pierina Di Micheli. Born on 11 September, 1890, Giuseppina De Micheli entered the Congregation of the Daughters of the Immaculate Conception in Milan on 15 October 1913. She received the habit and the name Maria Pierina on 16 May 1914, made religious profession 23 May 1915, and left for the motherhouse of the Congregation in Buenos Aires, Argentina, in 1921. She returned to Italy in 1921, and died on 26 July 1945. 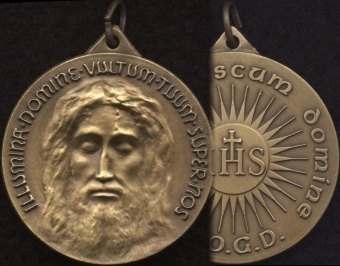 The scapular of the Holy Face became, with the approval of the Blessed Virgin Mary, the medal of the Holy Face, widely distributed by Mother Maria Pierina, by her spiritual father, Abbot Ildebrando Gregori, O.S.B., and today, by His Eminence Fiorenzo Cardinal Angelini and the Congregation of the Benedictine Reparatrices of the Holy Face. I was privileged, last month, to preach a retreat — Seeking God: the Holy Face of Jesus in the Rule of Saint Benedict — to a dynamic group of novices and professed Sisters of the Benedictine Reparatrices of the Holy Face from Italy, India, the Republic of the Congo, and Romania at the Casa San Francesco in Carsoli, Aquila, Italy. May the light of the Face of the Lord shine upon you! DEO GRATIAS! TE DEUM LAUDAMUS! Thanks for the info we’re very happy upon hearing that the Servant of God, Mo. Mary Pierina de Micheli is now Venerable. The day is drawing near for her to be raised in the glory of the altars and the Devotion to the Holy Face Devotion revealed to her to be canonically recognized by the Church for the benefit of all the faithful. The Community of Reparation of the Holy Face of Jesus will be celebrating the Holy Sacrifice of the Mass in joyful thanksgiving to the Holy Face of Jesus for this wonderful Christmas blessing for all His brothers (hfb), sisters (hfs), associates (hfa), devotees (hfd) & young devotees (hfy). I’ve received your reply regarding the Holy Face Convention 2008. We’re very sad that you couldn’t make it this year but I hope that you can be our main speaker next year. At least for now our invitation is one year in advance. Thank you for your fast reply Father. Rest assured that we will always keep in touch with you. It’s God’s grace that we had came to know you Father and were very grateful to the Holy Face of Our Lord for it. We will always include you in our prayers & sacrifices. Please remember us everyday in the Altar of the Lord. May the Lord bless & keep you & show His Face to you & give you peace!